Care should be taken in this area. Lophophora echinata Croizat var. lutea (Rouhier) comb. nov. There are also the names Lophophora diffusa var. lutea, Lophophora texana var. lutea and Lophophora williamsii var. lutea appearing in horticulture. This name is at best confused. Based entirely on what he read in Rouhier, Croizat asserted the existence of a plant with a yellow body and a yellow flower. This suggests it is likely to merely be a diffusa but Rouhier’s account does anything but clarify that as it confirms that Rouhier is indeed Croizat’s source of information and also includes a pair of photographs of a plant cultivated in the manner of the day with its roots largely exposed, but gives its origin as needing resolution. He then adds a claim from Leon Diguet that this plant can be harvested in northern Mexico in the breaks of the Rio Grande. “Il y a lieu, sur cette question qui reste encore à résoudre, de tenir compte de l’affirmation autorisée de M.Diguet qui nous dit avoir recontré et récolté ce Peyotl au Nord du Mexique, sur les rives du Rio Grande. 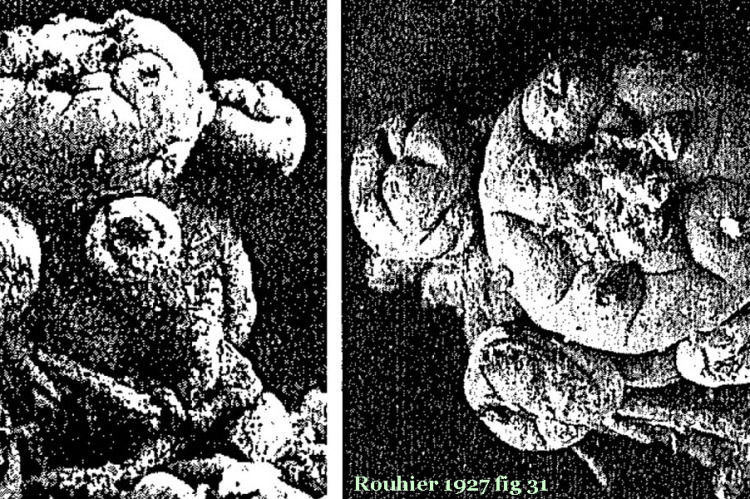 ” This does not say that Rouhier’s plant WAS actually collected from there of course. Which combined with the images Rouhier included might suggest an echinata sensu Weniger is possible although yellow certainly seems quite wrong for either body or flower. Rouhier also wonders about it possibly being a hybrid but it is not clear what he contemplated as the possibilities for a novelty introducing parent. While it seems tempting to jump past Rouhier and say Croizat’s assignment must have been an error, something that does seem to be accurate to say is that this name is confused in application. Plants bearing this name in horticulture at present are typically L. diffusa and are said to be named “lutea” based on their body color. 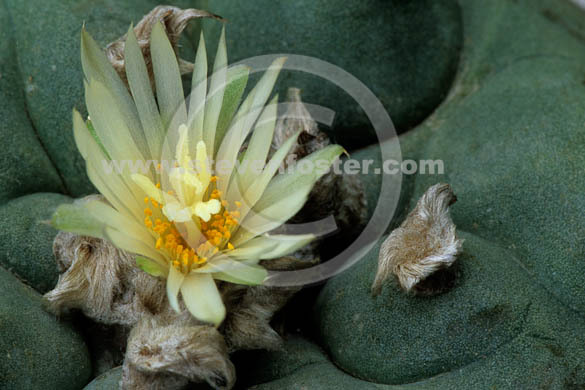 One can additionally find horticultural offerings and images for odd plants such as “Lophophora lutea var. texana” = “Lophophora williamsii var. texana.” It is probably not really worth anyone’s time to try and address all of the existing conceptual and nomenclatural glitches. Recall that photo from Frič earlier? Check out that far left plant. 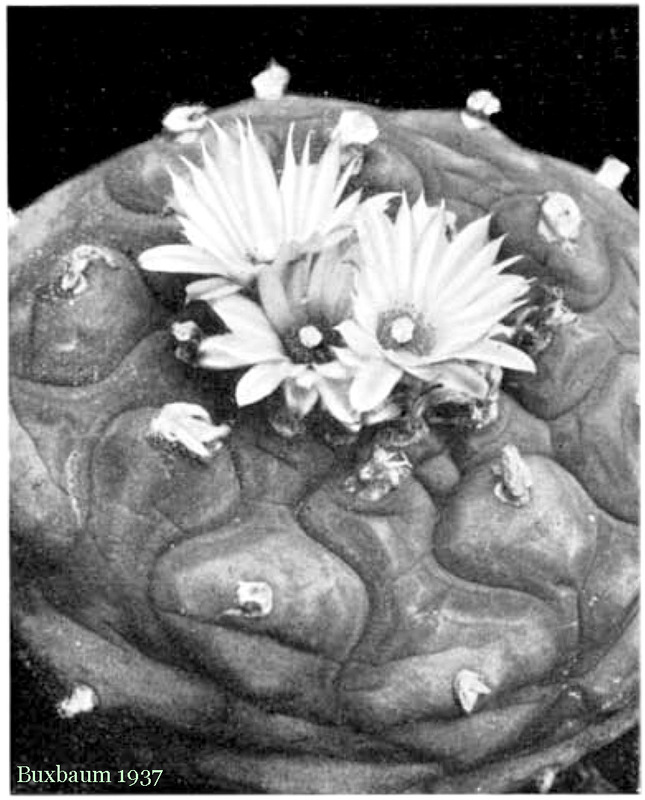 As part of a curious lineage, Alberto Frič had presented what appears to be Lophophora diffusa in 1924 (crown #I above) calling it Lophophora sp. nov. lutea Frič. 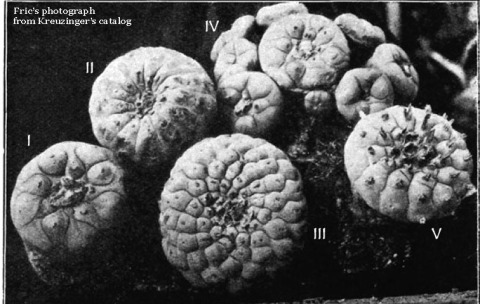 By 1935, he had changed its name to Lophophora Lewinii (perhaps basing this on the opinion of the day increasingly embracing Ochoterena 1922?). Frič should have stuck with Lophophora sp. nov. lutea Frič. 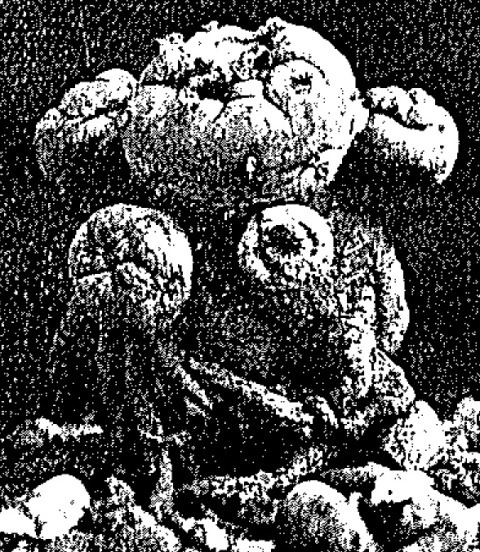 In 1961, Backeberg iterated Frič’s name, and, using the same photo by Frič, published it as Lophophora lutea sp. nov. Backeberg. Lophophora Tiegleri and Lophophora Ziegleri, also typically just refer to horticultural Lophophora diffusa. Similarly Lophophora Ziegleriana, which will be mentioned only briefly later. This is a name that is still encountered in horticultural offerings. This currently is most often L. diffusa and is usually in reference to a yellowish body color on the plants. (Lutea is from the Latin; Luteus: “Yellow”). The original ‘description’ by Alexandre Rouhier included reference to a yellow flower color on what he presented to be Echinocactus Williamsii, which is not demonstrated to be linked to any distinct population. MS Smith points out that if flower color alone is used to assign this name, then L. diffusa would remain the most likely candidate for cultivated plants. More comments can be found above. The opinion expressed by Helia Bravo was that *all* reports claiming yellow flowers on L. diffusa (which includes a fair number of people in Europe AND commercial offerings) were simply white flowers that had become dusted with pollen. The publication of photographs in black and white and the *commercial offerings of yellow-flowered plants* since the early part of the last century, or at least plants sold with the name sp. luteiflora, both suggest that yellow flowered Lophophoras exist but that is clearly tempered by their near absence in published or in online photographs. 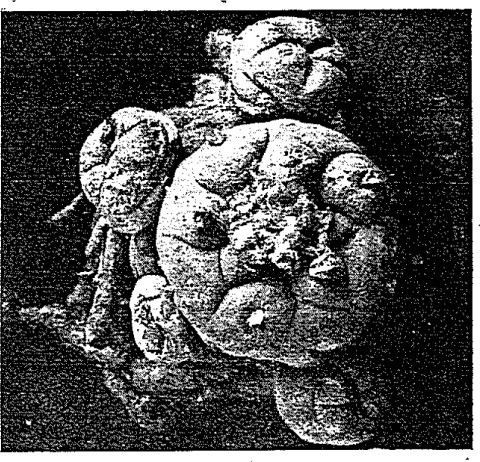 Pizzetti 1985 includes a color picture (without a flower) claimed to be this “species” (entry #153). Pizzetti states that it has also been called L. ziegleri and is differentiated from L. williamsii by having “scarcely tuberculate ribs divided by winding grooves, yellowish down, and larger, pale yellow flowers”. In my experience the felt color of L. williamsii has been observed to be highly variable and is not infrequently yellowish, sometimes very much so. It has commonly been said that Rouhier’s yellow flower was in error. That may be yet I have witnessed at least one, if not more, individual of Lophophora williamsii with distinctly pale yellow flowers in the Texas populations. Clearly those have been a rarity. Some years ago I actually ceased mentioning this to people simply due to becoming bored with those people who wanted to argue that I had never seen this. I certainly can’t prove it since those plants crossed my path more than 30 years ago but it is what it is. It IS noteworthy however that in all of the photographs of Lophophoras that were recently locateable using Google images one of those appeared to have a flower that might actually be a light yellow but could simply have been white and catching a bit of reflected color from adjacent yellow hairs. I can only locate one single color image with a flower that is clearly pale yellow. I’d assume that image to be of a Lophophora diffusa. The relative dearth of color images showing yellow flowered Lophophoras should not be trivialized as it supports this to be a rare phenomenon. 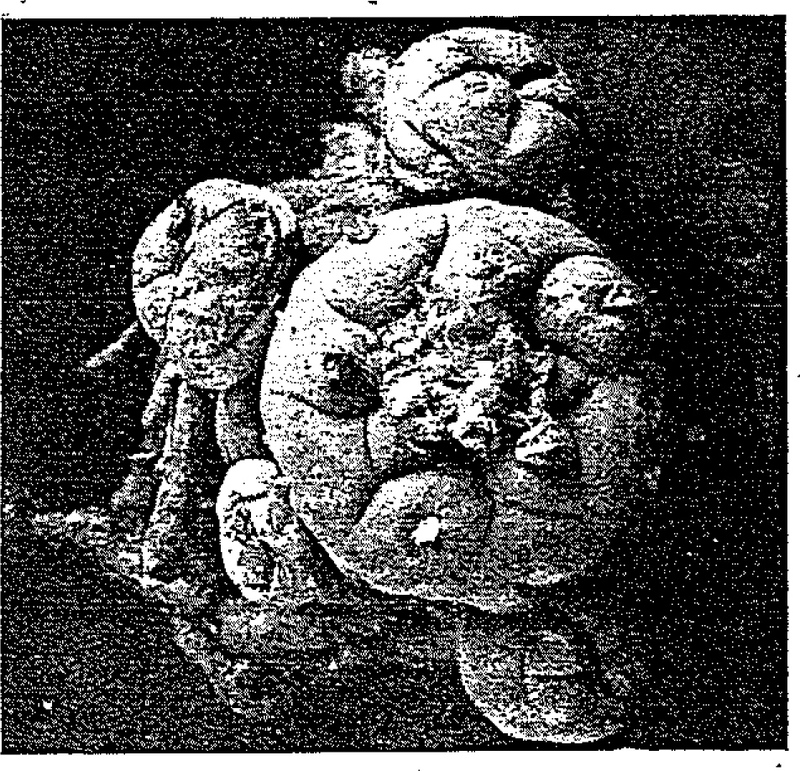 Lophophora Ziegleriana in Buxbaum 1937: Figure 7. Backeberg’s photograph.